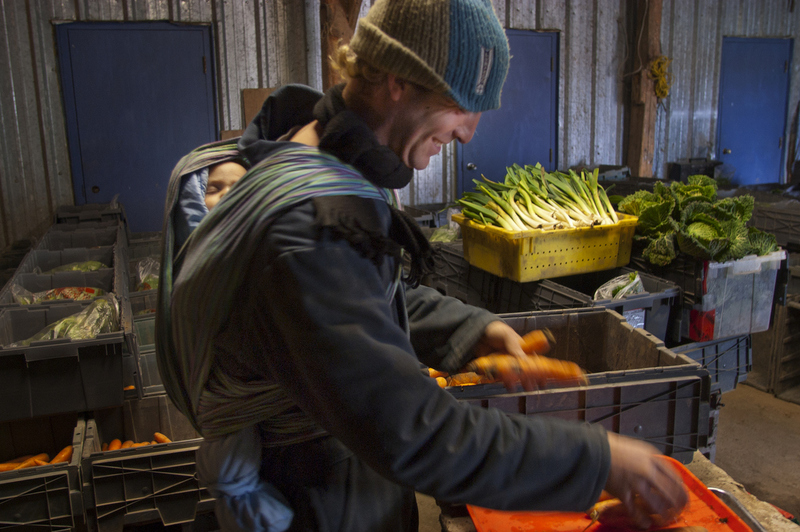 A photographic essay documenting Community Supported Agriculture programs, and the reality of Organic Farming in Quebec. 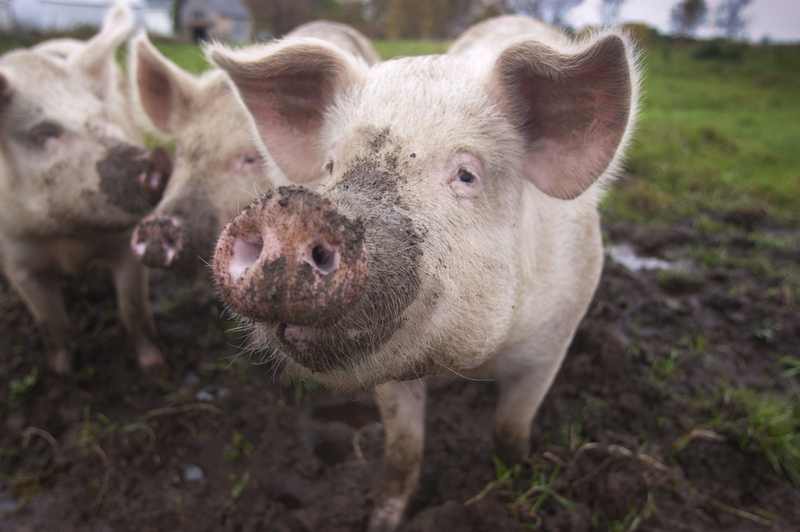 I worked along side family farmers, interns and all sorts of living creatures in hopes of crafting a portrait of the joy and pain of small scale sustainable farming. In collaboration with Equiterre. 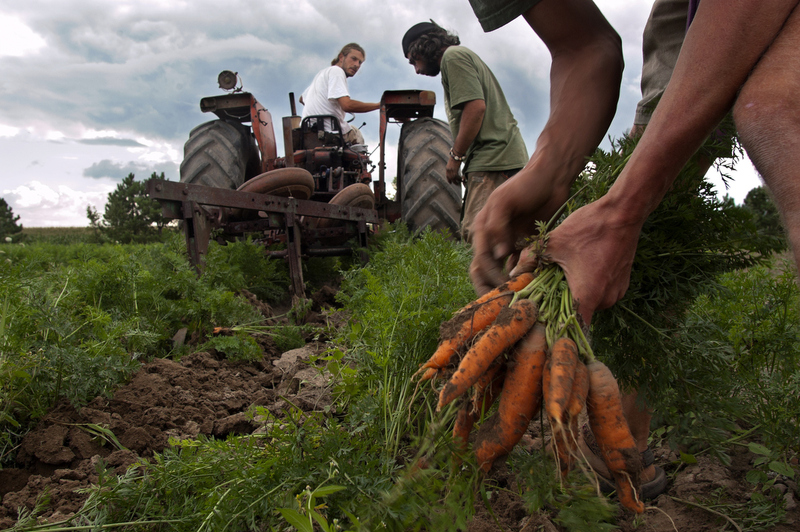 Workers collect carrots on Cadet Roussel Farm, a biodynamic farm in St Gregoire Quebec. 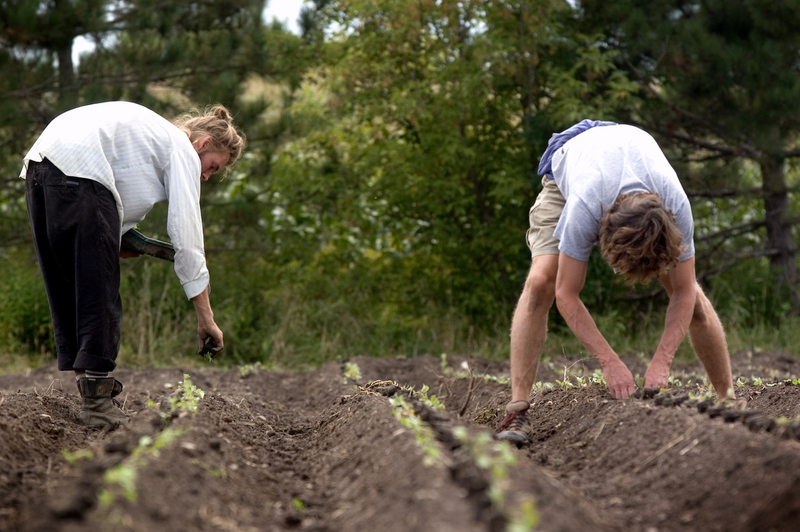 Workers on the organic farm Cadet Roussel transplant broccoli by hand. 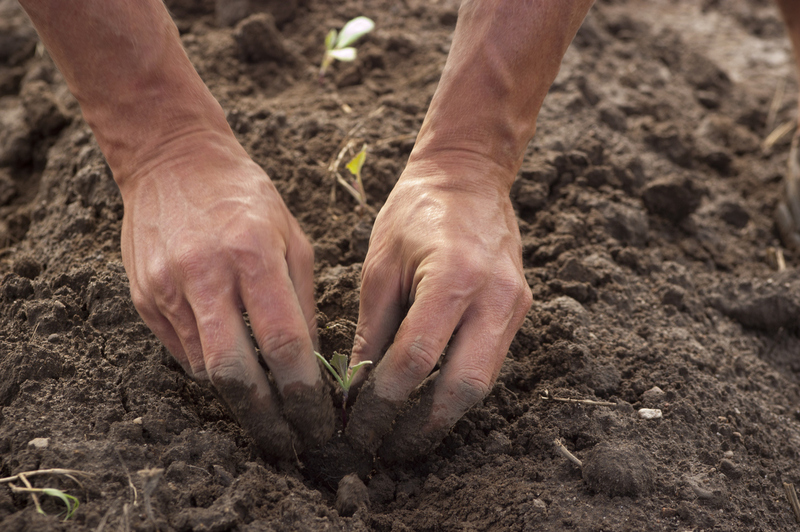 Contrary to conventional farming, much of the work on organic farms is done by hand. Workers on Verger aux 4 Vents, an organic orchard and vegetable farm, are bent in the field harvesting squash. Romain, an intern from France on Cadet Roussel farm walks through the early morning haze to get to work bright and early. 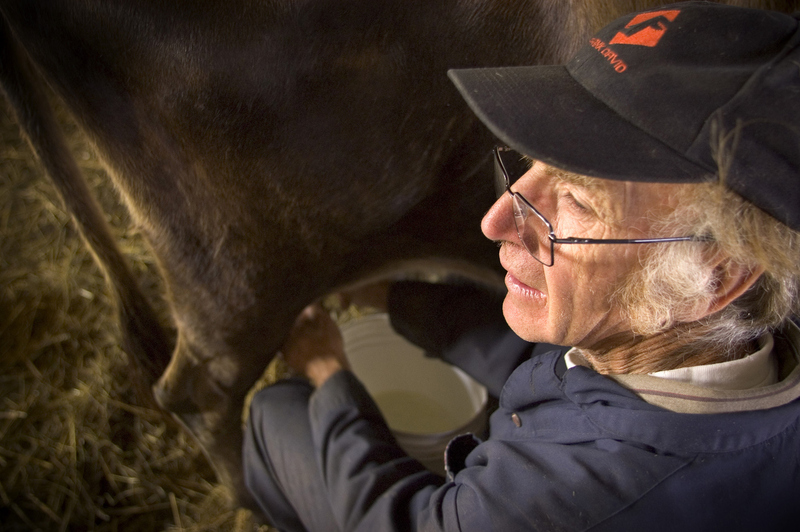 Jean Roussel wakes up with the sunrise to get the cows milked at the day’s start on Cadet Roussel Farm. 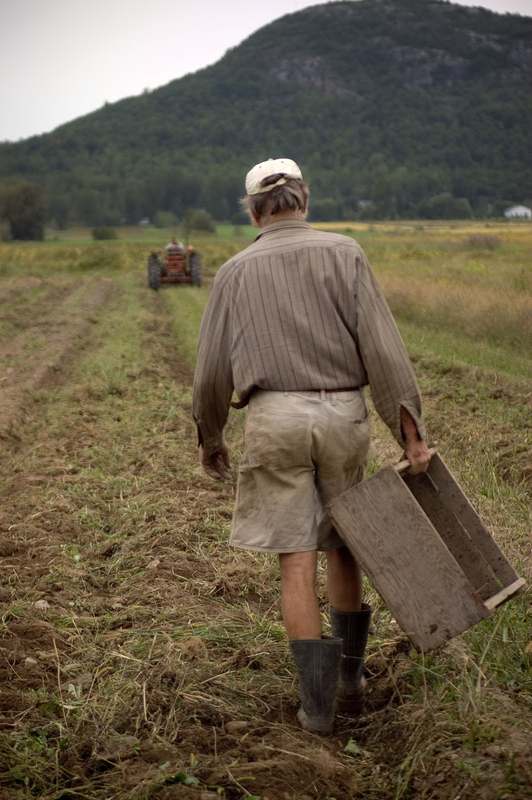 Jean Roussel walks towards his tractor at the end of the day, days are long on an organic. Jean was raised on an organic farm in France, and has been farming organic since 1980 on his farm Cadet-Roussel located in St Gregoire Quebec. Michel Massuard loads beans into a combine. The seeds collected will be used to plant next year’s crop of beans. Eric, a worker on Cadet Roussel farm, Mont St-Gregoire. Eric and Richard, workers on the organic farm Cadet Roussel transplant broccoli by hand. 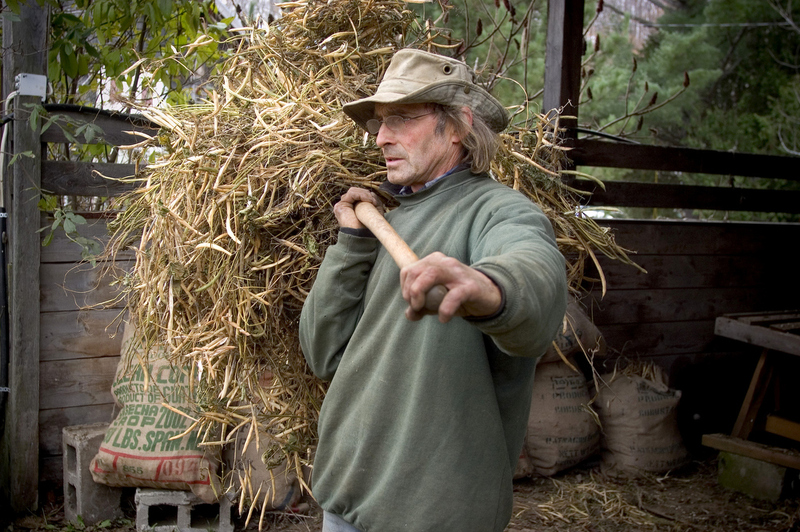 Contrary to conventional farmiong, much of the work on organic farms is done by hand. Charly, of Cadet Roussel organic farm, prepares CSA (community supported agriculture) baskets as son Gauloin has a cat nap. The farm delivers weekly baskets to their partners in the city. A pig on the organic farm Cadet Roussel. 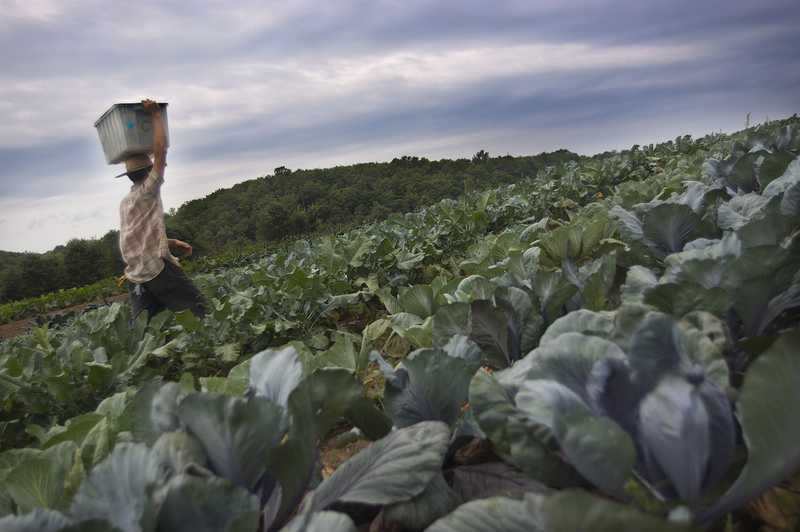 Workers on Cadet -Roussel farm weed the lettuce patch. Contrary to conventional farming, weed control is more labor intensive requiring more “hands on” work from workers. 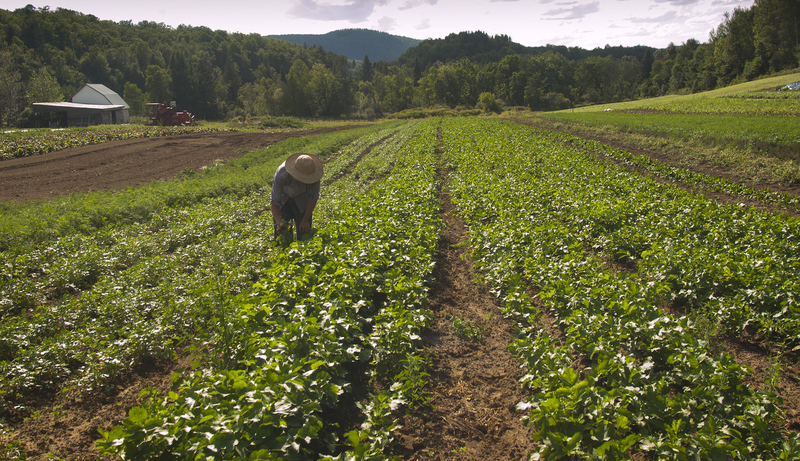 A worker on Vallon des Sources farm in Ripon Quebec carries freshly picked produce from the field to the farmhouse . Michel Massuard and wife Monique are up at 5 a.m collecting green onions for weekly partners’ baskets on their organic Farm in Ripon Quebec. 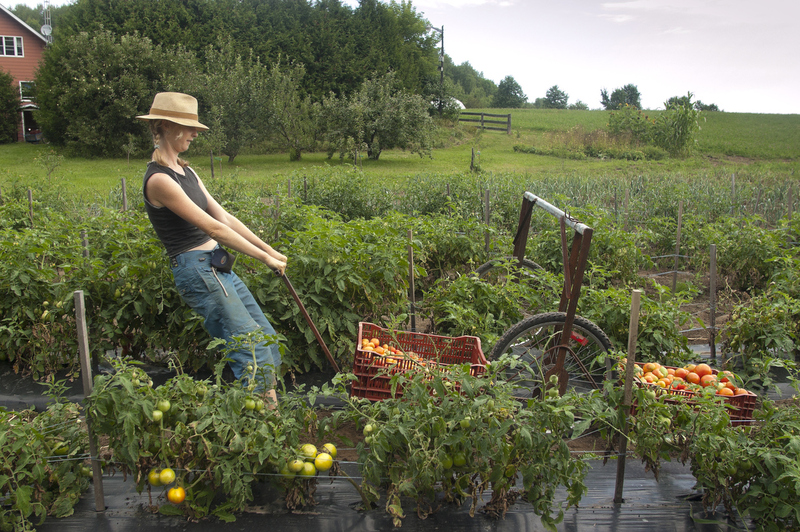 Juniper, a worker on Vallon des Sources, an organic farm in Ripon Quebec, harvests tomatoes using a device constructed and built on the farm. 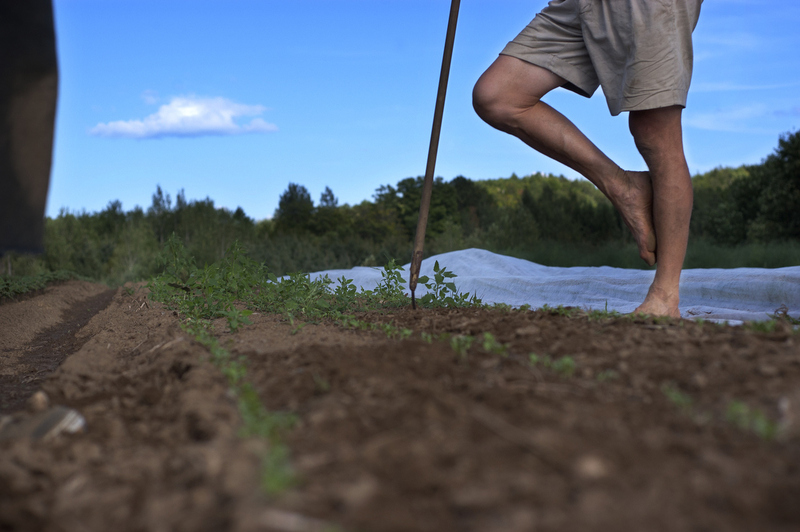 Workers take a rest from weeding at Vallon des Sources, an organic farm in Ripon Quebec. 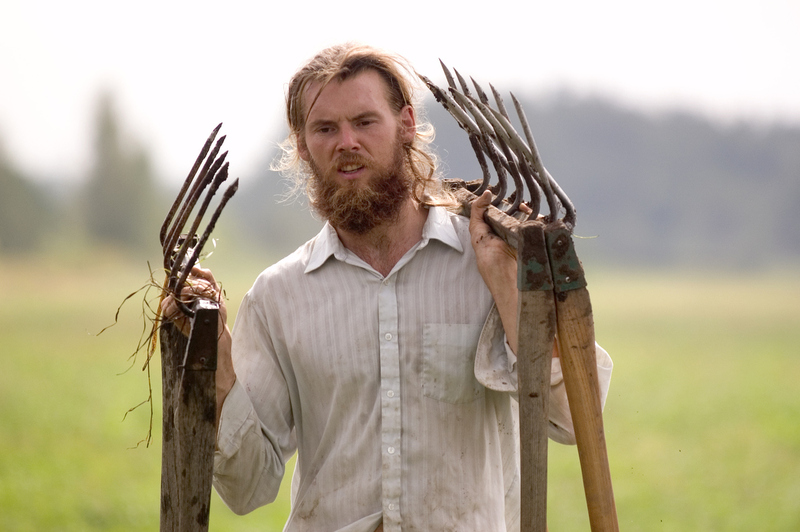 Alex, a worker on Vallon des Sources, an organic farm in Ripon Quebec, weeds rows, and rows of vegetables. 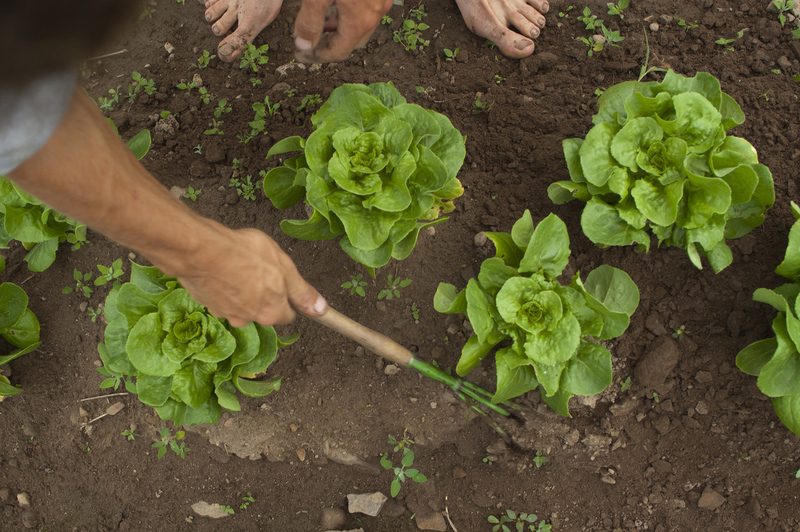 Contrary to conventional farming, a lot of weeding is done by hand on an organic farm. 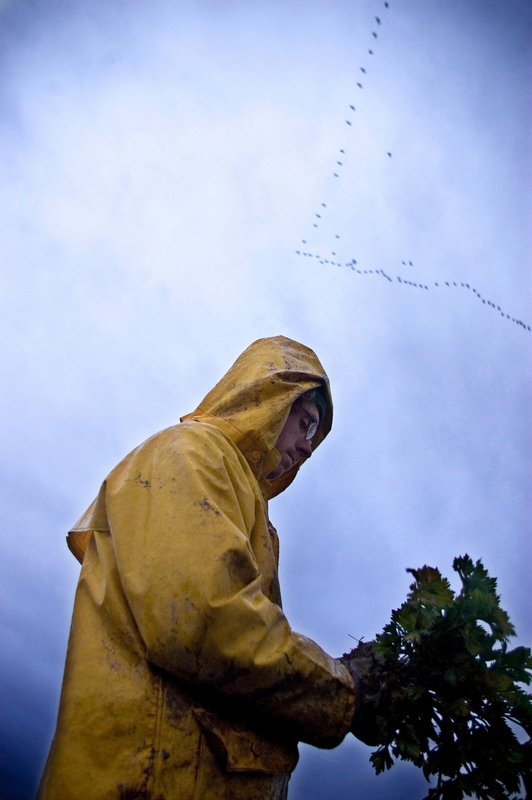 Despite the rainy and muddy conditions, Richard, a worker on the organic farm Cadet Roussel harvests celery-rave in late october as Canada Geese fly south. 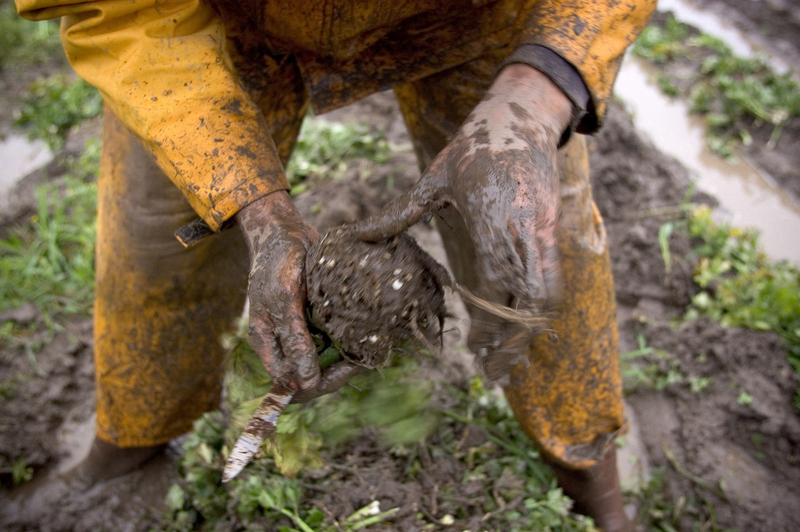 The hardy root can be harvested as late as november, perfect for Quebec’s climate. Anne lifts her son as the sun sets on workers in the carrots field on Cadet Roussel farm. Children can often be found amidst the fields on an organic farm where there is no risk or danger of pesticides.